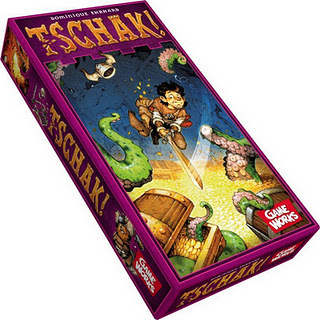 Metagames » Blog Archive » Review: Tschak! Each level is played slightly differently. On level 1, players simultaneously play 1 card at a time from their hands three times to make their total. On level 2, players simultaneously play 2 cards and then 1 card. On level 3, players play all 3 cards simultaneously. This leaves each player with 1 card and these earn their owners 3, 2 and 1 gold based on the highest card values (gold being worth 1 VP each too). Some treasures are cursed (so worth negative VPs) and some have other effects like cancelling 1 monster’s negative VPs, etc. Plus, at game end, some treasures and monsters earn (or lose) even more points if a player has multiples. On its own this already seemed like it would be a fun game. However, there is an extra twist which I think is very clever. After each round, the cards do not get collected, shuffled and re-dealt; instead, players simply pass their hand of used cards to the next player clockwise. This means that during the game players will use the same hands as each other. This happens no matter how many players are playing as there are always 4 hands of cards dealt. So, with fewer than 4 players, 1 or 2 hands sit out each round. Overall, Tschak! 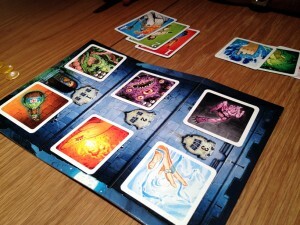 is a fun filler which offers a clever and simple card-game mechanic. I really like the principle that all players will take turns playing with the same sets of cards but these will be different each game too. Whilst players play with the same hands each round, the rounds play out differently as players make different decisions on what cards to play together (which is influenced by the fact that the treasures/monsters that can be earned are different each time randomly selected each level). I found it very interesting deciding which cards to use to try and win (or intentionally lose) levels, and this decision-making process is also affected when you see what other cards players have laid down during levels 1 and 2 when you have a chance to react to what they played. The game plays quickly and there’s no downtime as players are always involved. As the game is published by Gameworks it is no surprise (and very pleasing) that the artwork is lovely and the box has moulded compartments for the different components. The designer of Tschak! also designed Condotierre, Lascaux and Water Lily so I was pleased to see Tschak! lived up to those standards. Tschak! is an excellent, fun filler with plenty of those groaningly entertaining moments when you see another player played the card you hoped/thought/bet they wouldn’t. This entry was posted on Wednesday, November 2nd, 2011 at 10:18 am	and is filed under Board Game Review, Board Games, Essen Spiel 11, Tschak. You can follow any responses to this entry through the RSS 2.0 feed. You can leave a response, or trackback from your own site. Good point. Thanks for pointing that out. I have updated the post accordingly. Thanks.